Mjolk, the much-touted furniture and home decor shop in the Junction has been been open a little over two years. Sound like a good time to release a book? Mjolk certainly thinks so. The result is a stunning guide (read: ode) to the design capitals that most inspire them, namely Stockholm, Reykjavik, and Asahikawa, Japan. This glossy catalogue-style book is the brainchild of Mjolk shop-owners John Baker and Juli Daoust, who provided text and photographs, as well as book and graphic designer Emily Tu. 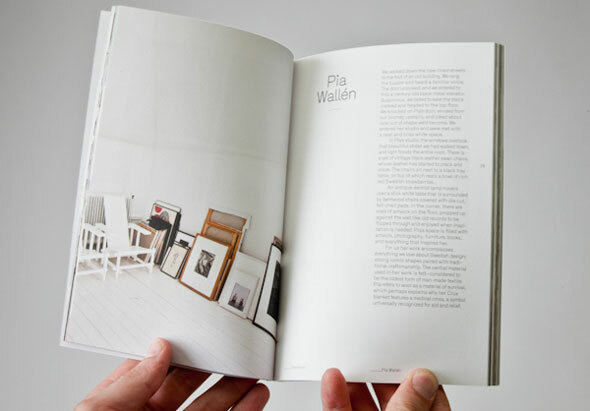 Inside the locally printed, 104-page book, you'll find pictorial tours of the workshops of Iris Hantverk--a Swedish company that uses visually impaired craftspeople to create hand-made household brushes--and Takashi Kougei (a Japanese designer of minimalist wooden tableware). There are also interviews with perfumier Andrea Maack and Vik Pronsdottir, a designer that works with Icelandic sheep wool to create odd and whimsically-patterned--what's the word? Snuggie-capes, perhaps? Particularly cool is Naoto Yoshida, an industrial designer-turned-savior of wasted wood whose company to.mo.ni re-purposes scraps of wood to make functional pieces--case in point: the WrapWrap, a sleek wooden wire management system. The whole shebang is a gorgeous little artefact of (and introduction to) fine and sometimes curious craftsmanship from around the world--much like Mjolk itself. Photos courtesy of Kitka Designs and Mjolk. Mjolk: Volume 1 can be purchased online.